Did we not get enough roasted poultry last week? Apparently not, because Tuesday night came and we found ourselves picking up a rotisserie chicken at our local supermarket. It was a "Superbird" which meant plenty of leftovers, and since we already did the pot pie thing with the turkey, it was time for something new and different. A recent purchase of the never-before-seen College Inn Culinary Broth Thai Coconut Curry was inspiration, and basis, for this colorful and delicious soup. 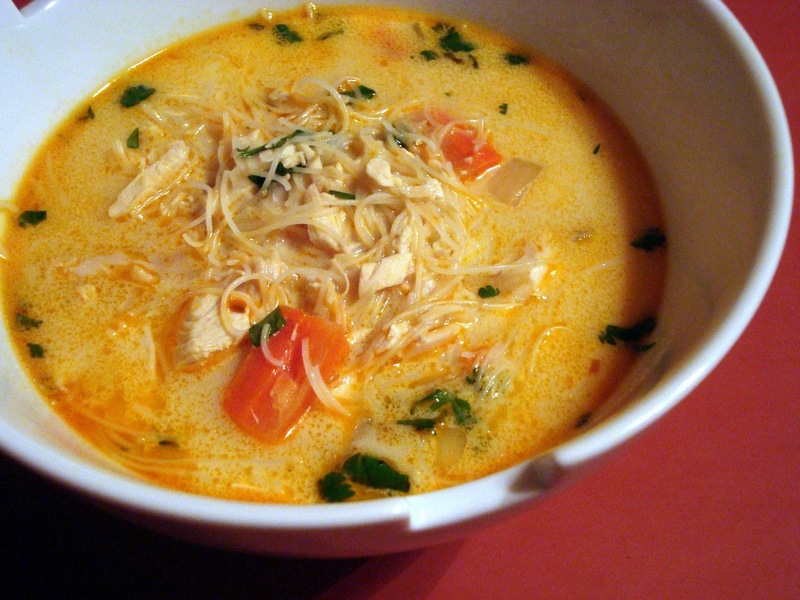 The warm spiciness of the curry makes it the perfect soup for a cold winter's night, and an excellent use of leftover chicken! Heat the oil in a large pot over medium-high heat. Add the onion and carrots and cook, stirring occasionally, until vegetables are softened, about 6 minutes. Add the garlic, curry paste and red pepper flakes, and cook, stirring, 2-3 minutes. Stir in the broth and coconut milk, season with salt, and bring to a boil. Lower heat and add the noodles and chicken. Simmer over low heat 5-6 minutes until chicken is warmed through and noodles are tender. Turn off heat, then add the lime juice and cilantro. This sounds like just what the doctor ordered! How delicious! I love curry and a curry soup is perfect in the winter. Like the idea of it amongst all the typical holiday flavors at this time of year too. Mixes it up a bit! Thank you! this reads delicious. but is that thai coconut curry an imperative here? Perhaps if you added some ginger, additional garlic and curry paste and more coconut milk to a regular chicken broth, you could get the same flavors. thnx for getting back. yeah it makes sense.